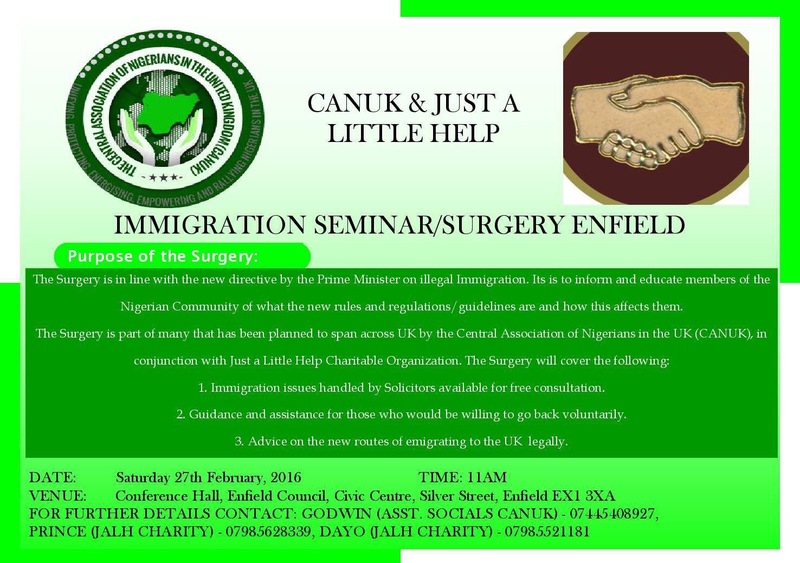 The Central Association of Nigerians in the UK (CANUK) in partnership with renowned charity Justa LittleHelp will be holding their breakthrough ‘Immigration Seminar/Surgery’ initiative in Enfield on Saturday the 27th of February. The event is an opportunity to get FREE advice by reputable lawyers on all immigration related issues. 3. Advice on the right avenues to take for those wishing to emigrate to the UK legally. 4. Assistance on general queries on how to obtain citizenship, bring a loved one over and repatriation for deceased members of family. If you are in need of immigration legal assistance or know of anyone who is, this is a perfect opportunity to seek the help you deserve!